Do I seem to be stuck in a rut? Sorry but we’ve been getting some interesting questions on our discussion board lately and caterpillars seem to be a hot subject this time of the year! Hi, I am in Dutchess County, NY. Can you give me an idea as to what is eating my kale? Thanks! First off, I must say that kale is a great vegetable! These tasty greens are packed full of excellent vitamins, minerals, and antioxidants. Because it’s so rich in nutrients, kale has been dubbed as one of the healthiest vegetables on the planet – the “queen of greens!” It is also very versatile and has many great uses in cooking and for using raw. Chopped kale is a great addition to soups and I always put in a big leaf or two when I make smoothies – de-lish! Anyway, back to caterpillars because they’re certainly the critters eating her kale leaves. This picture she sent shows classic caterpillar damage. 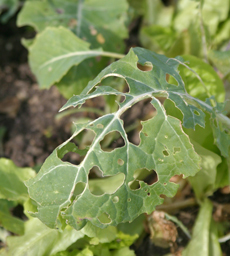 Cabbage loopers, imported cabbageworms, and diamondback moth caterpillars are caterpillars that commonly feed on cole crops (plants in the cabbage family which includes kale). Other familiar members of this family are broccoli and cauliflower, Brussels sprouts, kohlrabi, and collards. All these plants are susceptible to attack by caterpillars. 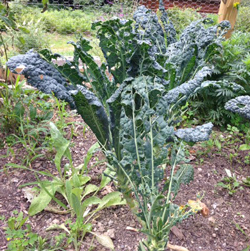 I have never tried growing kale but we have periodically tried growing broccoli and even Brussels sprouts in our garden. These crops have never been very successful because of the whole caterpillar issue. 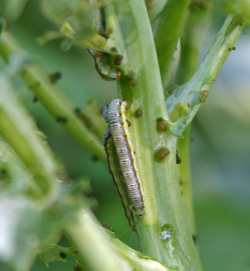 We would usually get just one cutting of broccoli before caterpillars would explode all over the plants. The broccoli would become so disgusting with chewed leaves and frass (caterpillar poop) that we would just end up yanking them out. The few times we tried growing Brussels sprouts, they became infested with aphids and caterpillars and never really produced buds – not that I think I would have eaten them even if they had. Don’t get me wrong, I love Brussels sprouts but not ones that have been sucked on by aphids and chewed on by little caterpillars! Can you tell we didn’t spray? row cover and a stronger frame. 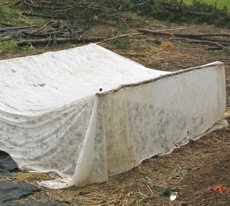 Since cole crops don’t require pollination to produce a crop, one way to protect them from caterpillar damage is to cover them with a floating row cover to keep the adult butterflies (or moths in the case of the diamondback moth) from laying eggs on the plants. We tried that this year. I wasn’t going to grow broccoli but Eric wanted to try it one more time and use the floating row cover idea to protect the plants. Here’s the thing, though. You have to put the row cover over the plants before the eggs are laid! We had it well sealed so that no adults could get inside but there must have been eggs or tiny caterpillars already on the plants because after a month or so, there were quite a few cabbageworm butterflies fluttering around inside our row cover tent. Oops! Needless to say, the broccoli plants had been ravaged by the caterpillars and I yanked them all out – again! I think we will just buy broccoli at the grocery store from now on! If we DO ever try growing it again, I will begin spraying early with Bt (Bacillus thuringiensis) or Bonide Captain Jack’s Deadbug Brew (spinosad). These are two organic controls that I have mentioned before for killing caterpillars while being kind to beneficials. The other option is hand picking; but in my experience, the sheer numbers of these caterpillars make this control method impractical and in addition, since most of the common ones are green, they are well camouflaged and hard to find! On another note, I think I may try growing some kale in our lettuce containers on the deck this fall – just for a test. The deck is pretty sheltered and I can cover the containers with plastic if necessary as it grows colder. It will be an interesting experiment. It may be too late but I think it is worth a try. Here is another caterpillar story! Caterpillars are boring inside my Cherokee Purple tomatoes. How can I prevent this? Spiders also MAY be boring inside too. 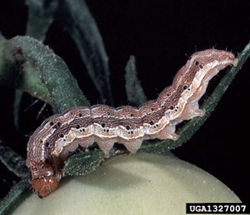 The caterpillar that is boring into her tomatoes is more than likely the tomato fruitworm (Helicoverpa zea); also known as the corn earworm or cotton bollworm. In fact one of the recommended ways to keep them away from your tomatoes is to keep your tomatoes away from your corn patch! They love fresh corn silk and tender young ears of corn and actually corn is the main host of this destructive caterpillar! Tomato fruitworm caterpillars are the larval form of a rather nondescript tan colored moth. 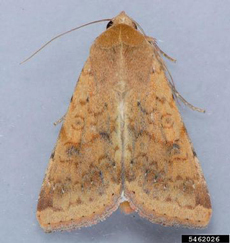 This moth lays solitary eggs on the host plant (e.g. tomato or corn) and can lay up to 35 eggs in a day. 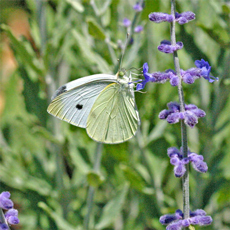 Small light colored caterpillars hatch out in a few days and begin feeding on the host plant. Older caterpillars vary in color from green to tan to brownish-red and most have stripes on the side of their body. The whole life cycle of these insects can be completed in about 30 days so there are usually several generations in a season. 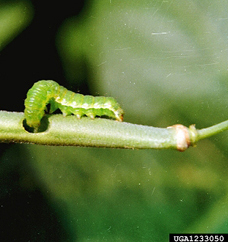 The young caterpillars often begin by eating foliage but then gradually move to the fruit which is their preferred food. They bore into green tomatoes (usually at the top of the tomato near where the stem joins the fruit) making a hole about the size of a pea. Once inside, they feed on the meat and pulp eventually turning the inside of the fruit into a mass of nastiness and rendering the tomato inedible. 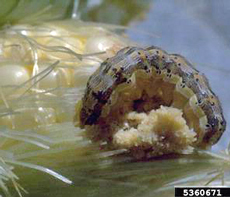 When they hatch on corn, they usually eat their way down through the silk and feast on the kernels at the tip of the ear. Sometimes they will bore through the husk on the side of the ear and consume kernels there, but they are most often found at the tips of the ear. These caterpillars are pretty competitive so usually there is only one per fruit. Because of this, they can damage A LOT of vegetables if they are not controlled. 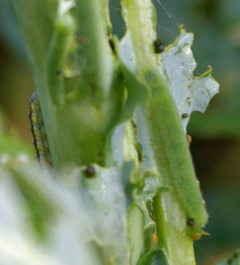 These caterpillars also attack green peppers, eggplant, and sometimes even beans. 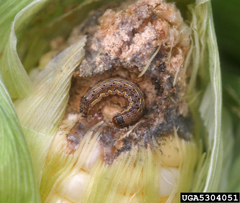 As far as corn as a host plant, once the silk dries and turns brown, it becomes less desirable and the fruitworm moth switches to tomatoes as a preferred host. This may be one of the reasons that tomato damage becomes more common later in the season. I have noticed a few holes in my tomatoes lately but didn’t see any caterpillars – I guess because they were already inside destroying the fruit! These tomatoes were quite disgusting and I threw them out. Until I saw this question on the discussion board, I had just attributed the loss to fruit rot from excess rain. Now I’m betting that it was tomato fruitworm damage. We did find quite a few of these caterpillars in the corn when we harvested it a few weeks ago. Luckily, with the corn, you can just cut off the tip and salvage most of the crop – not so with the tomatoes! The main problem with controlling these caterpillars is that once they bore inside the fruit, they are protected from insecticides. The trick is to control them before they find their way into the fruit. 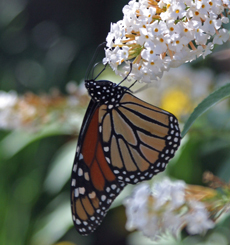 Monitor your plants for eggs and young caterpillars throughout the season and destroy any eggs you find on the foliage or simply remove any leaves with eggs. tip of an ear of corn. Other than hand-picking, one of the best and safest (for beneficial insects like bees and other pollinators) ways to control the caterpillars is to apply Bonide Bt Thuricide or Captain Jack’s Deadbug Brew according to the label directions. Both of these products contain bacteria that kill the caterpillars after they ingest foliage or fruit that has been sprayed. If your tomatoes are in bloom, be sure to spray in the evening or early morning when the bees and other pollinators are less active. Once the caterpillars get inside the fruit, there is really no control. In the fall, remove and destroy the old tomato vines. This will also help with disease control. 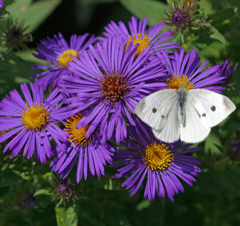 Tilling the garden in the fall will help destroy many of the overwintering pupae or expose them to the elements and to predators. Oh and the spiders? They must just be crawling into the holes made by the caterpillars. Spiders are carnivorous and would not be eating tomato flesh. Perhaps they are going into the holes in search of an insect or two for lunch! Walking through our woods back in mid-July, we came across several clusters of Indian Pipes. 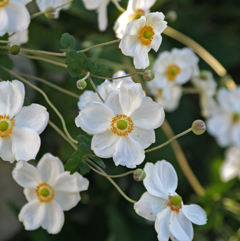 These delicate looking plants have a waxy texture and are generally pure white. They are quite striking against the brown background of leaf litter on the forest floor. Looking at them, you would swear they were a type of fungus. There is not a trace of green on them anywhere. The ones in our woods were pure white or white with black flecks. 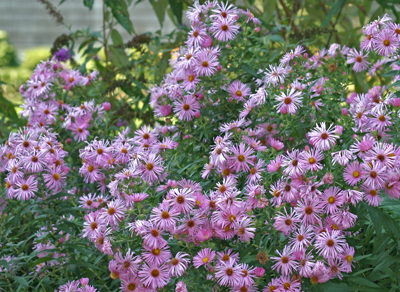 Sometimes they can be found with a blush of pink or even a red tint to the stem and flower. Yes, I did say flower! 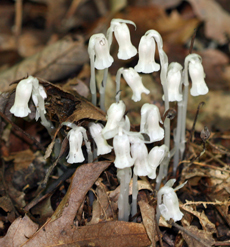 Indian pipe (Monotropa uniflora), sometimes called the Ghost Plant, is a flowering plant, an angiosperm, not a fungus. The lack of chlorophyll (the green pigment found in most plants) does not necessarily classify something as a fungus. Believe it or not, Indian pipes are in the same family of plants as blueberries, azaleas, and rhododendrons – the Ericaceae. 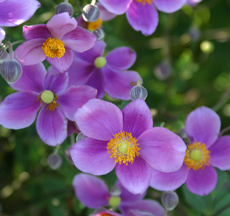 These wildflowers have very delicate flowers with translucent, waxy petals and sepals. 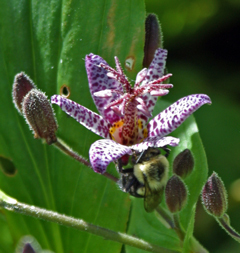 They are pollinated by small bees and other insects and eventually produce tiny seeds. 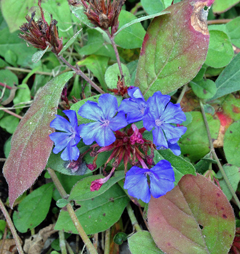 On the stem are small scale-like leaves that, like the stem, contain no chlorophyll. Each stem bears a single flower; hence the species name uniflora, “one flower”. 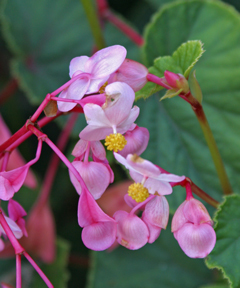 As the flower matures and the seeds develop, the flower begins to turn upward and eventually points straight upward, becoming aligned with the stem. directly from the roots of their host tree. Green plants are autotrophic (self-feeding) and produce their own food through photosynthesis. 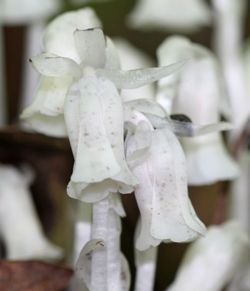 Indian pipes and other plants that lack chlorophyll, like squawroot, broomrape, and pinesap, are heterotrophic (other-feeding). Since they have no chlorophyll, they cannot make their own food and must rely on other organisms for nutrients and as such are parasitic plants. 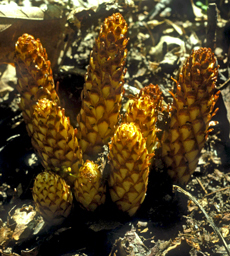 Squawroot (Conopholis americana) and broomrape are root parasites and survive by obtaining nutrients directly from the roots of a host tree. 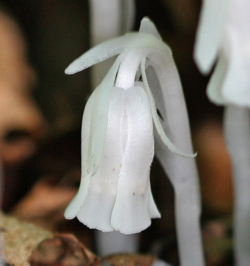 Indian pipes obtain nutrients from the host tree indirectly by way of mycorrhizal fungi. Mycorrhizal fungi are a type of fungi that form a symbiotic (mutually beneficial) relationship with trees and many other plants. In this association, tremendous numbers of mycorrhizal filaments (hyphae) attach to and enter the roots of the tree and then fan out into the surrounding soil. The mycorrhizal filaments capture minerals and water which are then transferred to the tree. These “extensions” of its root system exponentially increase the area that the tree can exploit for the raw materials needed for growth and also increase the tree’s tolerance to drought stress. In return, the fungi feed on carbohydrates and other nutrients that are produced by the tree. Each member in the relationship helps the other. Then along come the mycotrophs like the Indian pipes! Their roots tap into the mycorrhizal hyphae and “steal” nutrients from the fungi; nutrients that the fungi absorbed from the tree roots. These plants give nothing back to the fungi in return for the food they take nor do they provide any benefit to the tree that produced the nutrients to begin with. Such parasites these wildflowers are! What an interesting and complex system!